It's an unconventional film for Martin Scorsese, one that truly shows his range as one of the best American directors of our time and it doesn't disappoint. “Come and dream with me,” a character says a one point during Hugo, which would also have been a very appropriate way to begin the film. A story about a young orphan who lives at a train station trying to solve a mystery link to his father is not be a kind of film Martin Scorsese is used to doing, but it does not show. It is a film about dreams and magical realism adventures that is entertaining for both children and adults. Set in Paris during the 1930’s at a train station where a young orphan boy named Hugo Cabret (Asa Butterfield) keeps the station clocks running. He learned how to fix clocks from his father before he passed away. In a way of honoring his memories, Hugo continues to fix clocks and other gadgets around the station. One item in particular that reminds him most about his father is an automaton, a mechanical man his father received from a museum. Guided by an old journal of his father’s notes, Hugo tries to complete what his father and he were not able to do which is to get the automaton working again. Standing in his way is a special heart shaped key that Hugo must find in order to unlock a secret message the automaton is believed to have. In order to get the parts needed for the automaton, Hugo steals gears and other equipment from a local station toy shopkeeper, Georges Melies (Ben Kingsley). Melies is an old grumpy man who finally catches Hugo stealing from him one day. He takes Hugo’s father’s book of notes from him and threatens to burn them. Hugo follows Melies home and begs him not to burn his precious notes but the grumpy old man shows no sympathy. Hugo does manage to befriend Melies’ goddaughter, Isabelle (Chloe Moretz), who agrees to try to stop her godfather’s actions. The two form a friendship full of adventures and discovery as Isabelle shows Hugo the world of literature and he shows her the world of cinema. They stumble upon a book about the pioneers of cinema such as Lumieres’ Arrival of a Train at the Station and read about how the audience literally jumped out of their seats while watching because they were afraid the train was going to hit them. They soon discover that Georges Melies was actually a legendary filmmaker which begins another discovery in which they find a link between Melies and Hugo’s father. The second half of Hugo is really about paying respect to the history of cinema. Scorsese educates his viewers on the importance of Georges Melies’ legendary filmmaking career. Starting out as a French illusionist he turned to filmmaking as a way to display his technical special effects in a new medium. Clips from A Trip to the Moon are shown many times throughout the film. 2011 was a year in which the top two Oscar winners shared one major thing in common, they both paid tribute to the lost art of silent cinema. Both Hugo and The Artist showcase the extraordinary power of silent films and both illustrate the important influences from which films today came from. As I said when I reviewed The Artist, if you appreciate and are passionate about films you will appreciate this film. This is the second Scorsese film in a row that Ben Kingsley stars in (the last one being Shutter Island) and Kingsley certainly does a great job with the role of Melies. The role demanded him to play a stiff old grumpy man whose days at being at the top are long behind him. Asa Butterfield is excellent as the lead in Hugo just as he was for his previous lead role in The Boy in the Striped Pajamas. He is definitely a talented young actor as these two films confirm. It only makes sense that a film that is largely about the preservation of old films was done by Martin Scorsese as he is a huge advocate of such thing in real life. In 1990 he founded a non-profit organization that is dedicated to film preservation called, The Film Foundation. Hugo starts off more of a kid’s adventure film but ends up being more of a shrine to the beginning of film for adults. There are times were it was fairly predictable but considering it was aimed for all audiences it is not all that surprising. 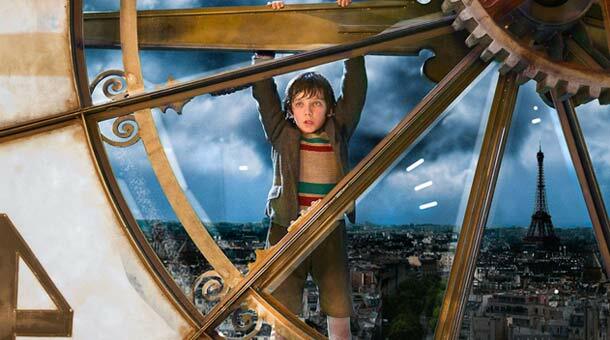 There are love stories mixed in with magical adventures as well as a history lesson in filmmaking all found in Hugo. It is an unconventional film for Martin Scorsese, one that truly shows his range as one of the best American directors of our time and it does not disappoint.